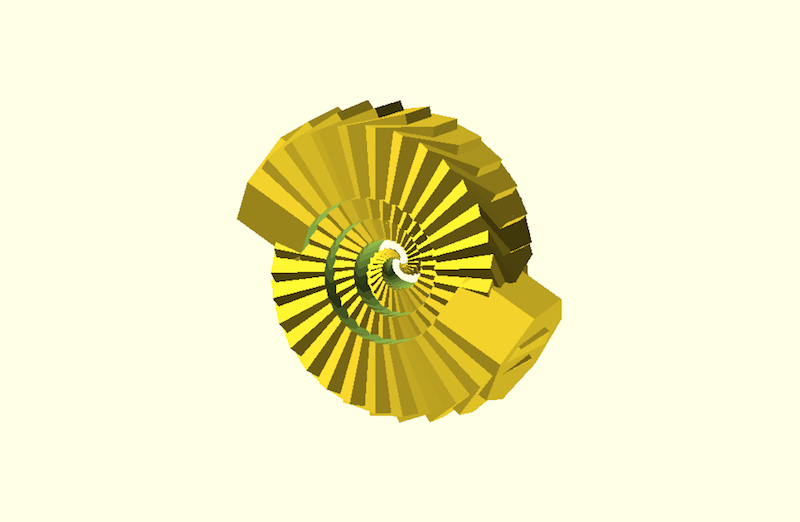 I think seashells are a great example of parametric objects in nature, so I was really interested in replicating similar structures in OpenScad. 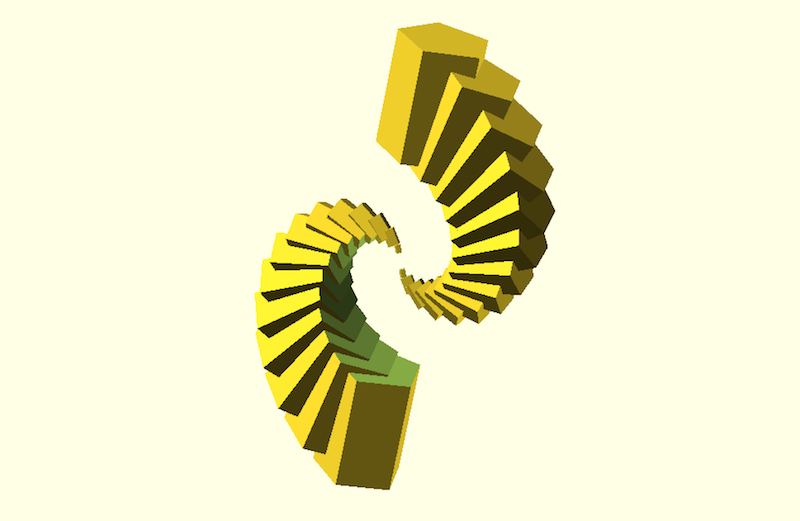 This algorithm draws a a seashell as a series of cylinders rotating around a center. 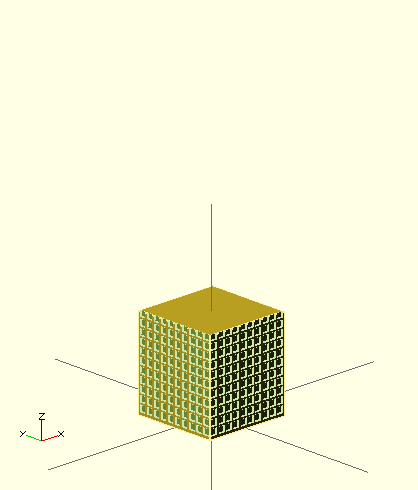 The algorithm takes as parameters a parameter proportional to the number of cylinders and a parameter for the width of each cylinder. This entry was posted in 13-Parametric-Object on 03 Feb 2014 by Maya Kreidieh. 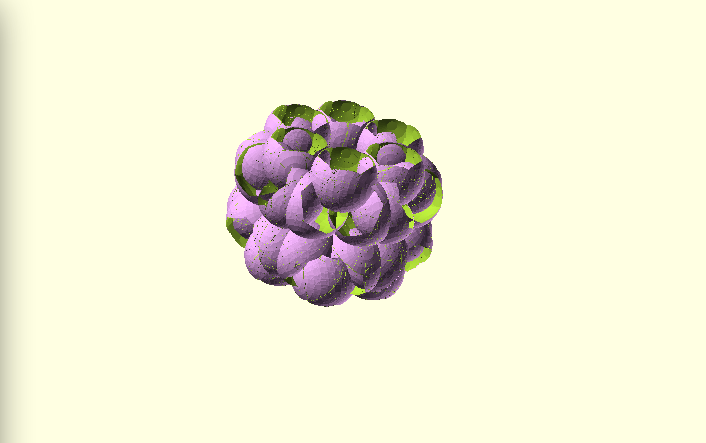 In this project I tried to generative spheres as a flower. 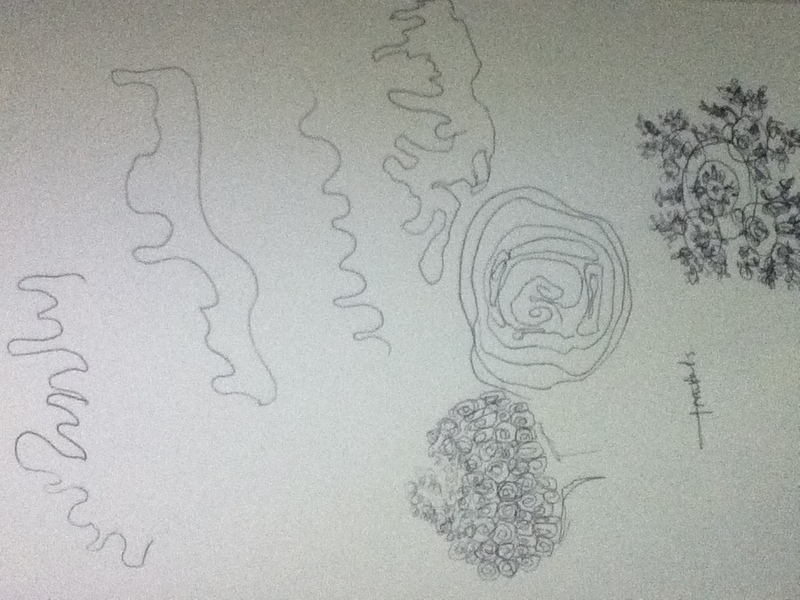 The first one is radiative and screw shape, the second is use 3 loops to create a flower cluster. 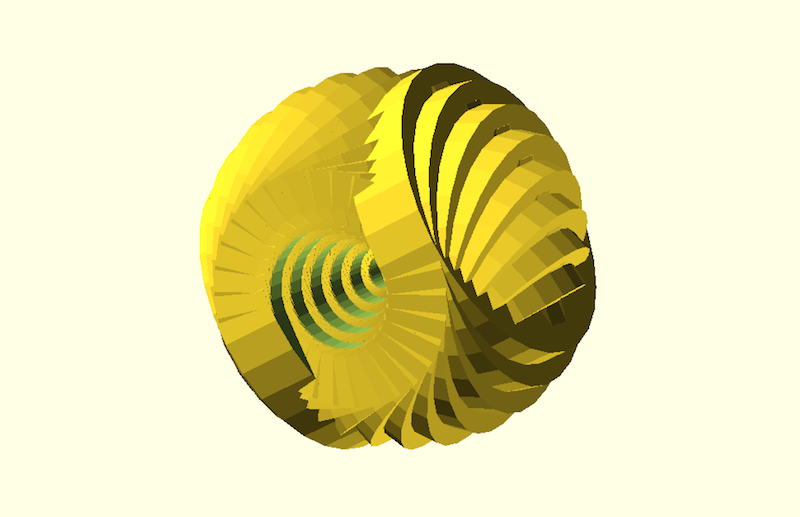 I did the second one from make a difference of two sphere as a petal and route them as a flower.I think OpenSCAD is a great tools to do iterative 3D modeling works. 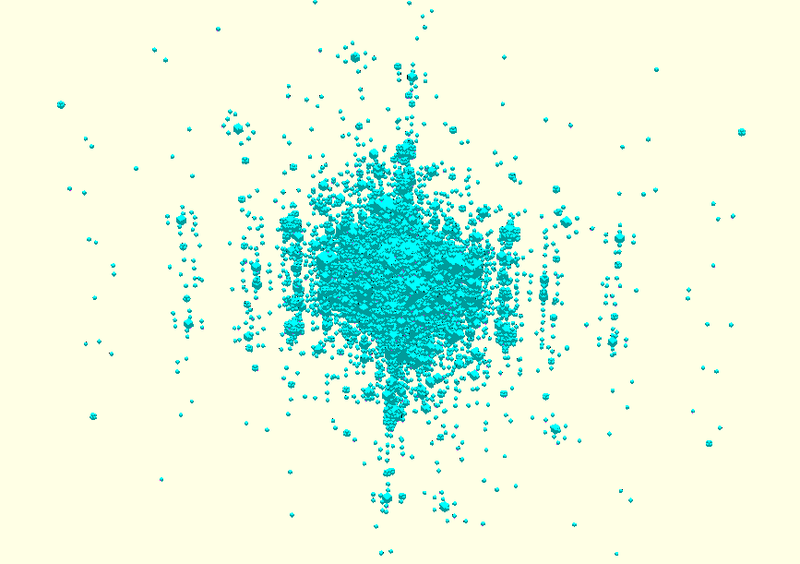 It makes maths beautiful. But The second one really ran slow on my mac, it takes long time to render the work, I guess this is the crucial weakness of the software. 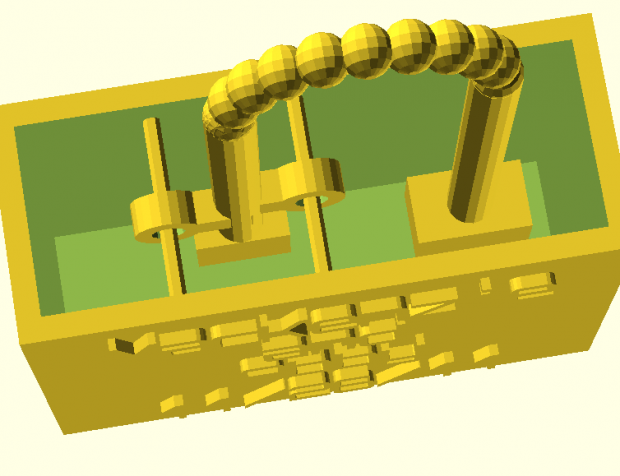 A customizable OpenSCAD “Universal Rack-Clamp” by @uzmani90- let’s you make a variety of structures, cost-effectively. 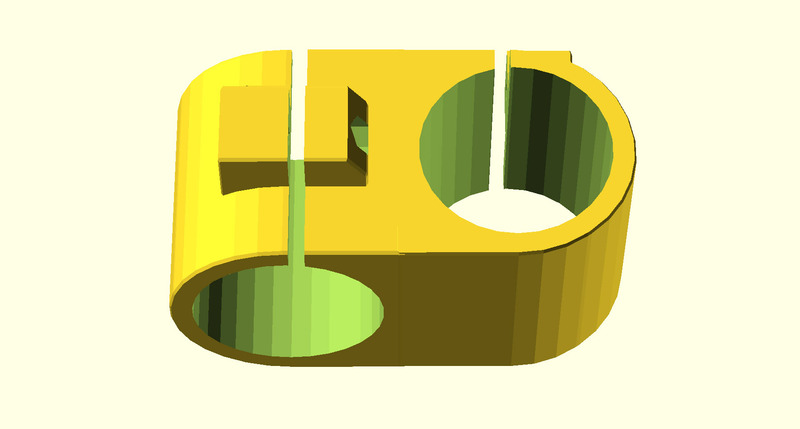 This summer while designing a DIY Electronic Drum-kit, I noticed that there existed no open 3-D CAD model of a Universal Rack-Clamp. 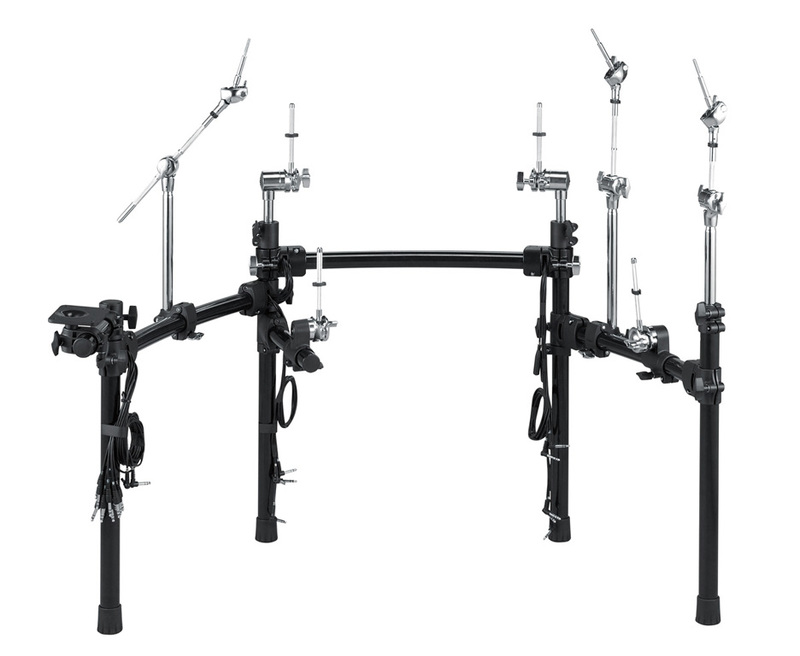 So what is a Universal Rack-Clamp? 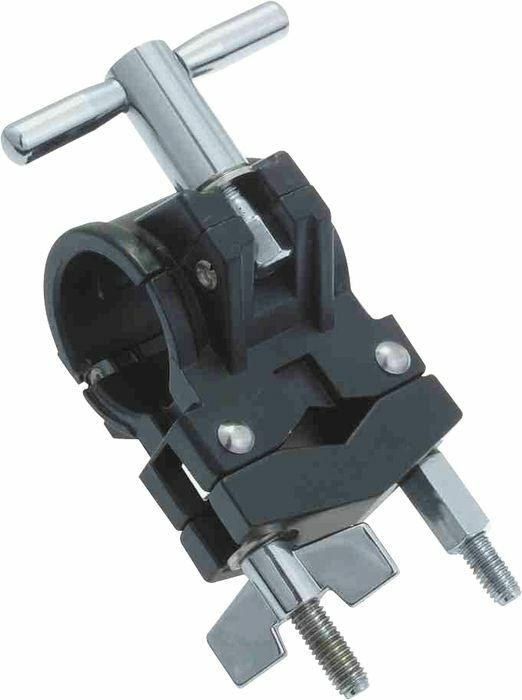 It’s the clamp used to put together pipe structures such as a working Rig (the ones used on construction sites) as well as Drum Rigs (the ones used to customize and hold Toms, Cow Bells etc.). 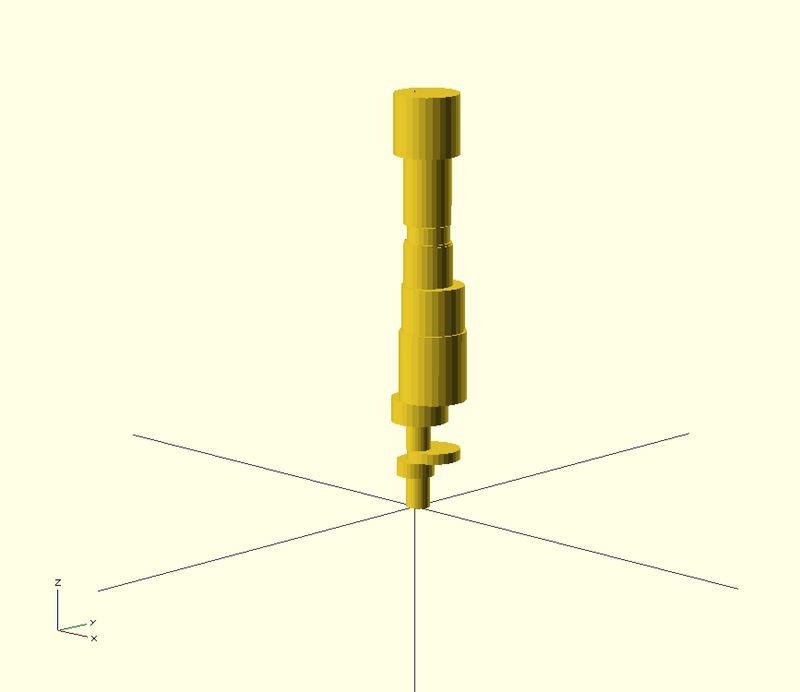 I made one using Autodesk Inventor for my project, but I think now is the time I make one using OpenSCAD which can be customized to different pipe and wing-nut/screw specifications. This clamp can be used to make anything that requires joining pipes (PVC, Metal, PPRC) with the constraint that the two pipes remain perpendicular to each other. 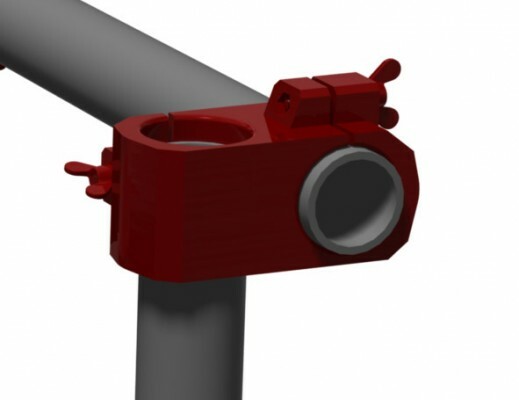 It allows a variety of structures to be constructed, which are adjustable in dimensions due to the wing-nut/screws. 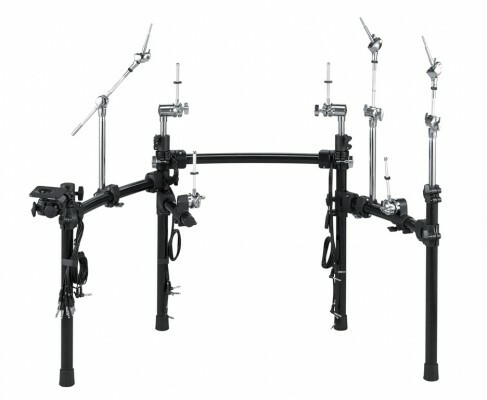 A Roland TD 30-K constructed using these Rack-Clamps. 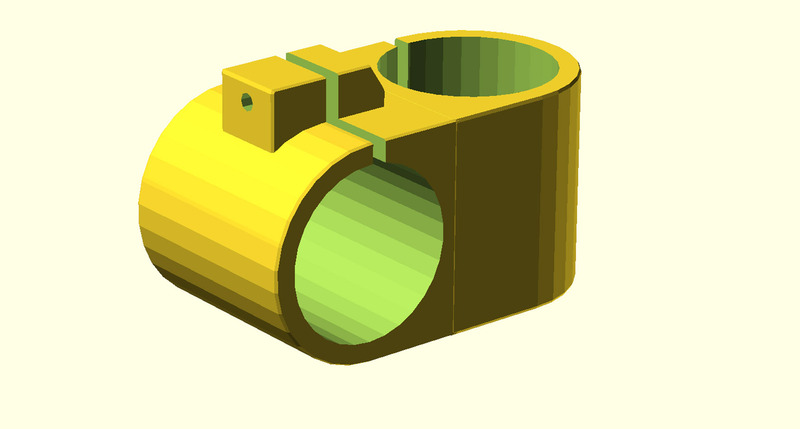 Here’s a version I made on Inventor in Summer 2013- we customized it for 3-D printing with ABS, modifying it for strength. With replacements rack-clamps running at ~$25 each, printing it is actually cheaper! 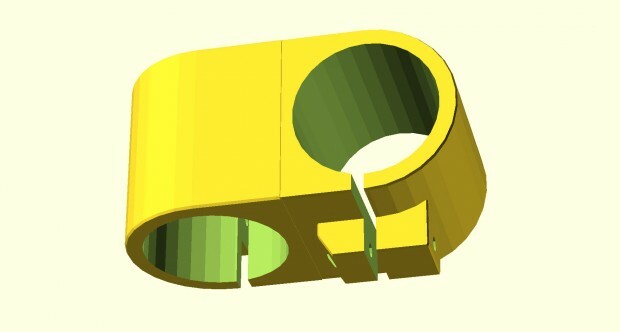 (you can get a whole ABS spool for that and print at least 3 of these for 1-1/2 inch Schedule 40 PVC pipe)- plus you can customize it to your exact specifications. S=1.2; // [1.2] Determines Strength of Clamp in Percentage-FIXED! First of all, I consider this very much a work in progress. 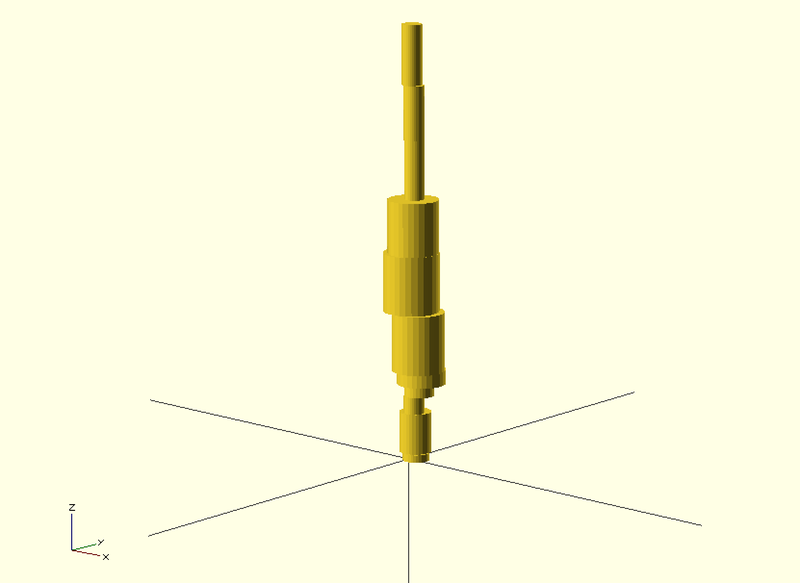 My parametric object is a monument that attempts to stand as a testament to my ability to be productive. 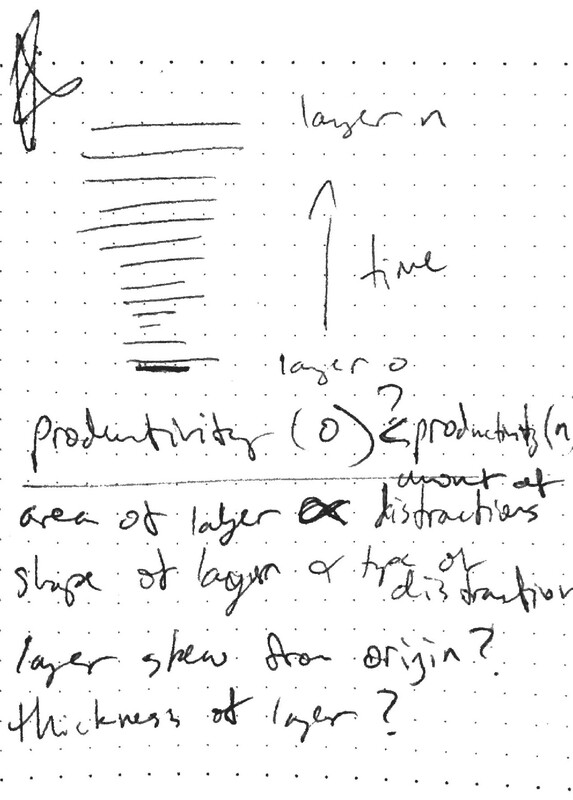 The object is part information visualization and part performance, representing my focus on work as time passes. 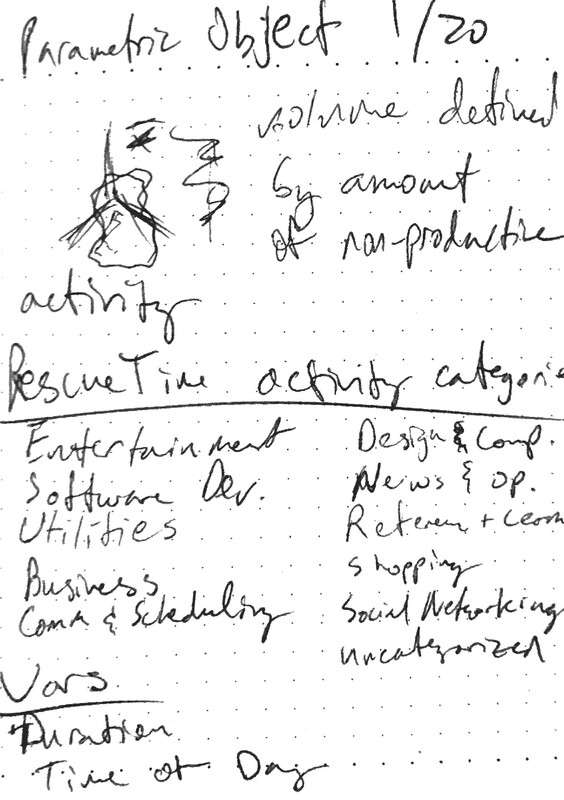 Using data from the application and service RescueTime, I was able to ascertain how much time I spent doing productive activity on my laptop and how much time I was being unproductive. 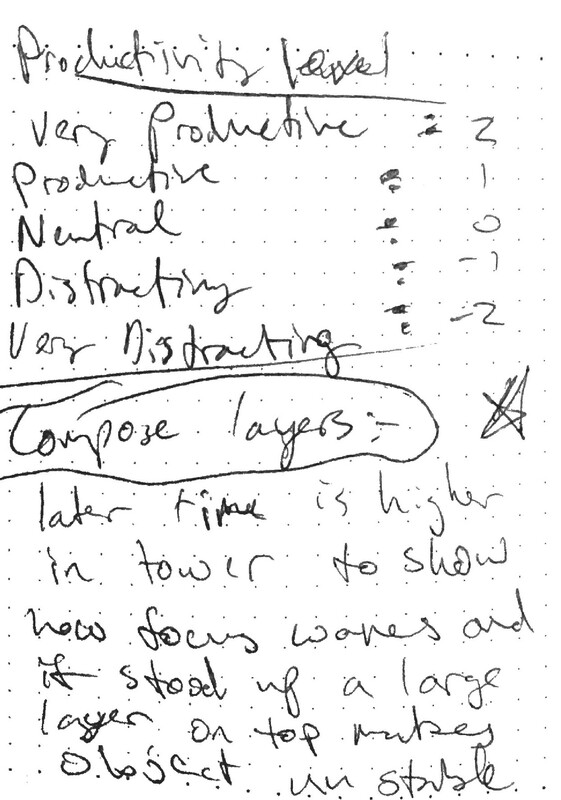 For each hour, a layer is made, with its height, skew from the center, and size determined by data such as time spent on the laptop and how much of that time was productive or spent on distractions. I was hoping to create objects that were both interesting and beautiful, however lots of work needs to be done to reach that goal. Carnegie Castles by @yemount. 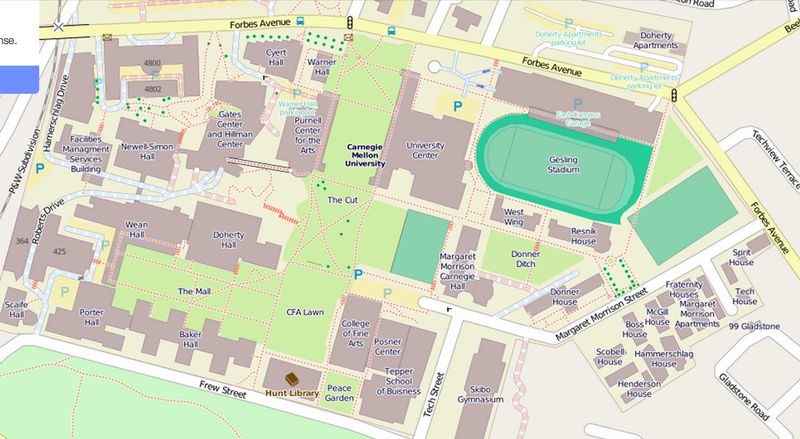 CMU buildings just stopped being boring. 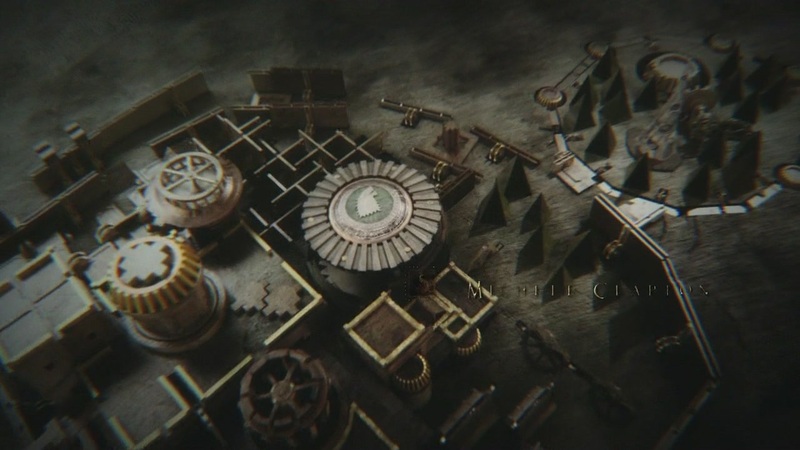 Out of a hundred awesome things about Game of Thrones TV series’ epic opening, I am the most impressed by the beautiful castle models made for Westeros’ cities. When searching for inspirations for the parametric object project, I came across this Winterfell model by damm301 and I instantly knew I wanted to build parametric medieval cities. 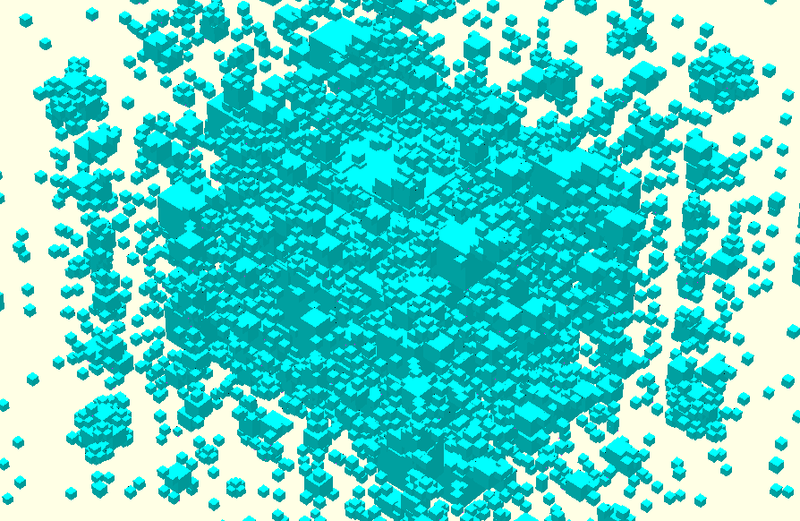 Top-down view of my generated Carnegie castles. Hopefully you can identify some familiar buildings like Morewood and UC. 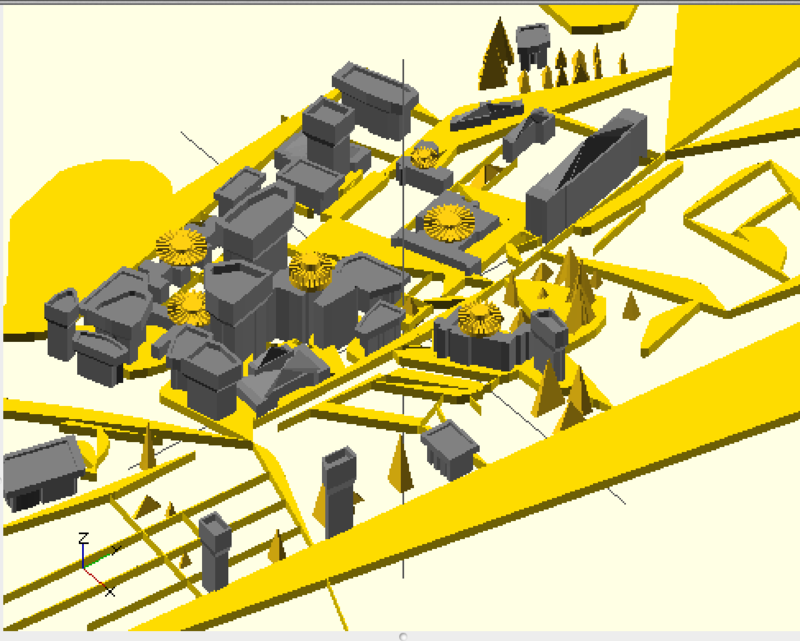 I’ve come to realize that openSCAD does not have a runtime environment and therefore does not have real variables. 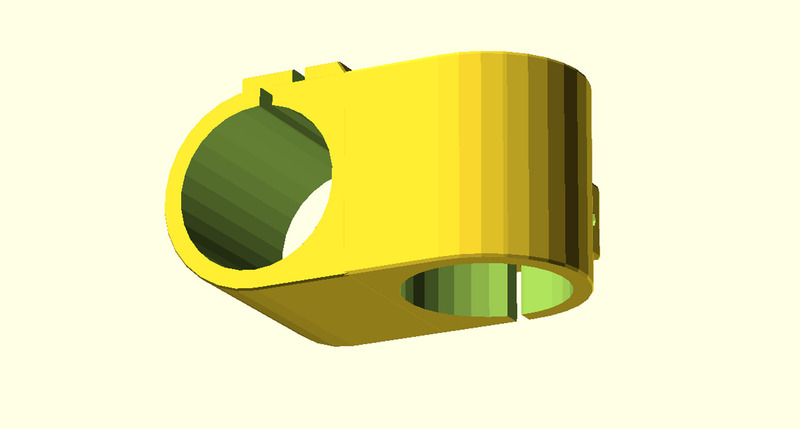 As a result, I had to paste raw data into the openSCAD file to make the thing compile, which makes the code lengthy and ugly. I don’t want to damage your eyes with my supper inelegant code, so I’ll provide the github link here instead of pasting code. 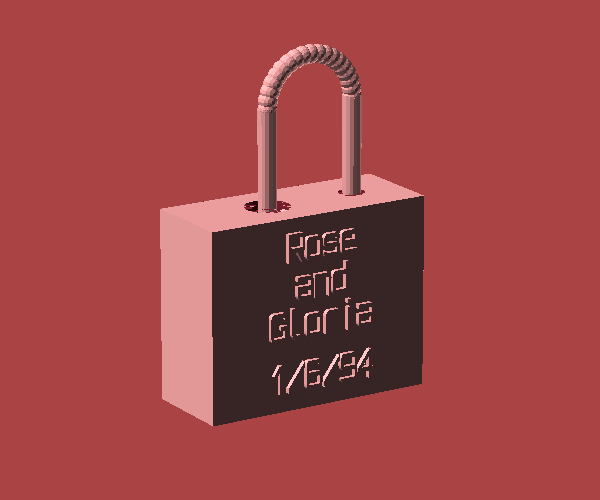 Customizable locks that would look great attached to your most romantic local bridge this Valentines Day! Locks can’t be reopened so no worries of keys or combos ruining the moment! Lock Bridges have been a growing worldwide trend for the last decade. 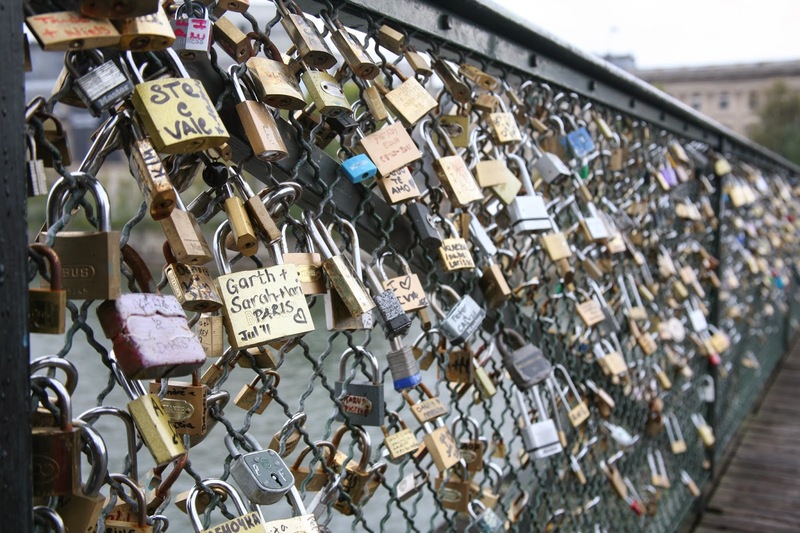 Those in love go to the bridges together with a lock and attach it to the bridge to signify their bond. Typically couples write their information with black sharpies onto the locks. 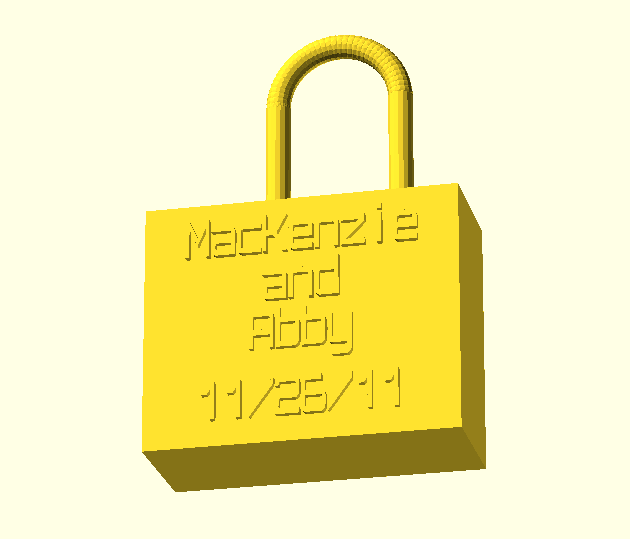 I have seen the lock bridge in Paris and my girlfriend and I have a lock on the Phipps bridge in Pittsburgh. One sad thing you notice when you walk past one of these lock bridges is that the sharpie has warn off most of the locks. 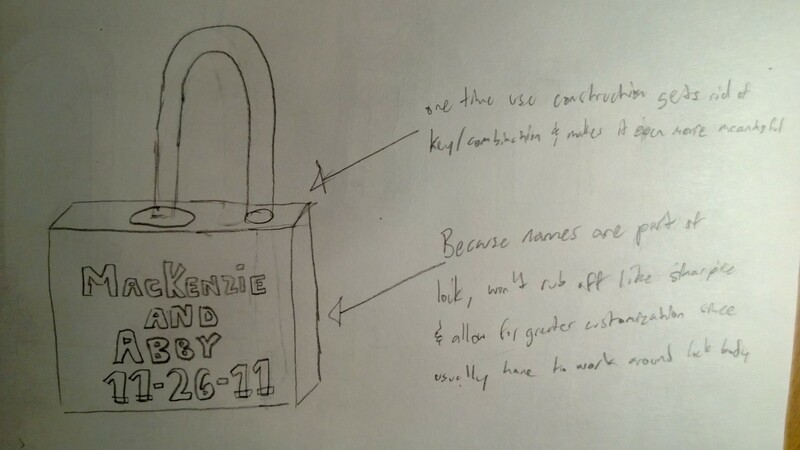 A proud few have engraved locks and avoid these troubles. 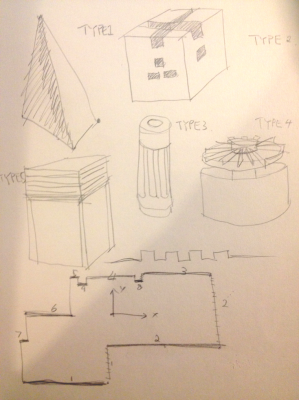 With Valentines Day approaching and lost for ideas of what parametric object to make. 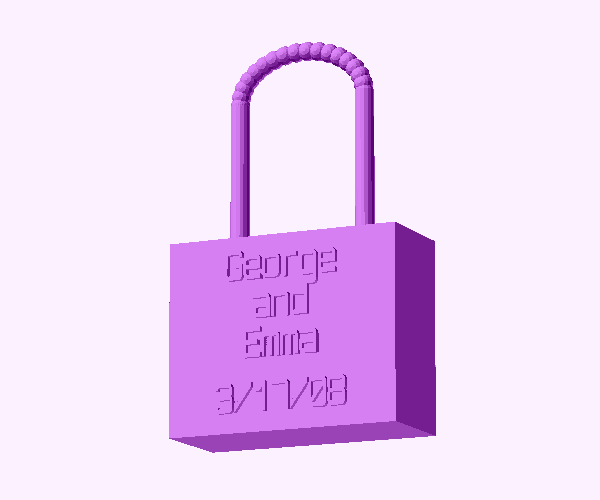 I decided to make a customizable lock, so that anyone with a 3D printer could have a customized lock that would withstand the outdoors better. Due to my lack of experience with making locks, I made the lock design be unopenable once closed the first time (when you put the lock on the bridge, you can’t open it, which is actually the point of it so it worked out well). 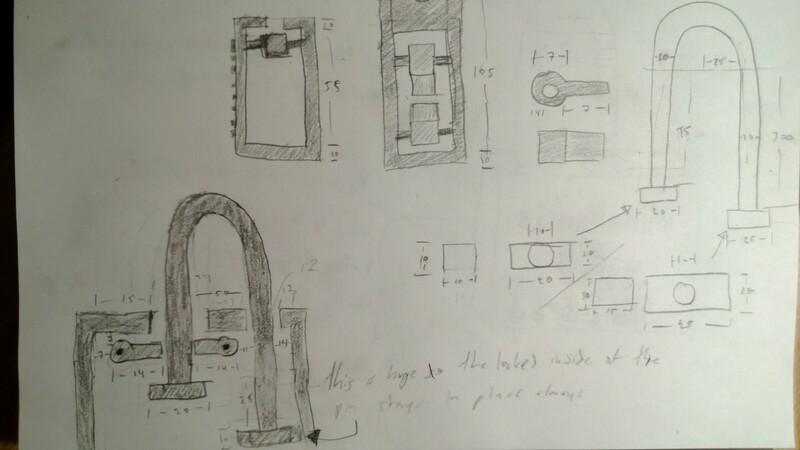 I have not gotten to test the lock because I don’t have a 3D printer, but I believe it should be functional and if not, would just require minor tweaking. I didn’t appreciate the pain of constructing a lock until now. 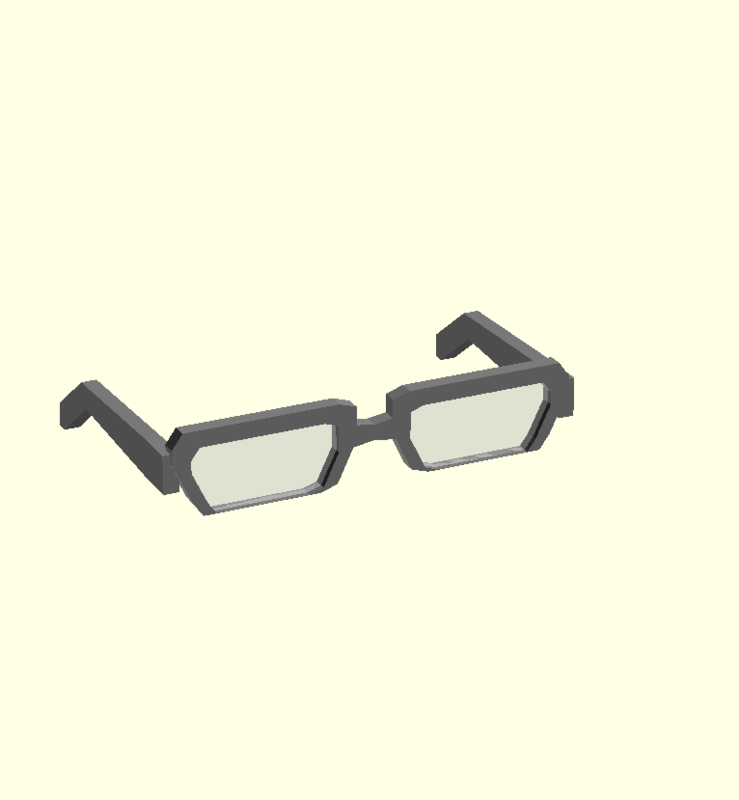 Glasses for the Masses by @creativethumbs is a fully customizable pair of glasses made with OpenScad. Essentially it’s a program that allows the user to specify the parameters of a pair of glasses–such as height, width, roundness, and lens tint–and creates a model of the pair of glasses with the desired specifications. I would like to think that people find this project beautiful and useful. This project was not inspired by anything in particular; it was more of a personal experiment because I am incredibly picky about the things I wear / what I put on my body. 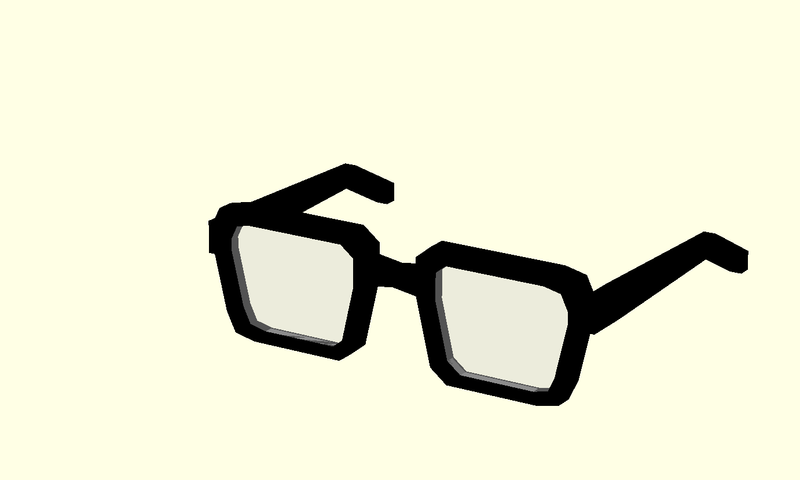 Because of that, when I have to go shopping for articles such as glasses I often leave the store empty-handed because I am not satisfied with their selections. Sometimes I would feel that an aspect of a certain design fits better with that of another, but there is no design that meets my expectations. Alternatively, I would find a pair of glasses that look exactly the way I want them to, but end up not fitting well. I was hoping to use this program as a way to address this conflict between consumer desires and product availability, and I also was interested in creating something that was practical as well as aesthetic. 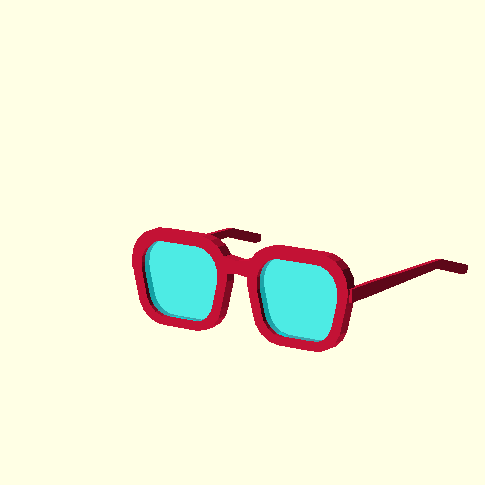 The program works mostly the way I wanted it to–it has a lot of variables that the user can change and the glasses actually look like glasses. 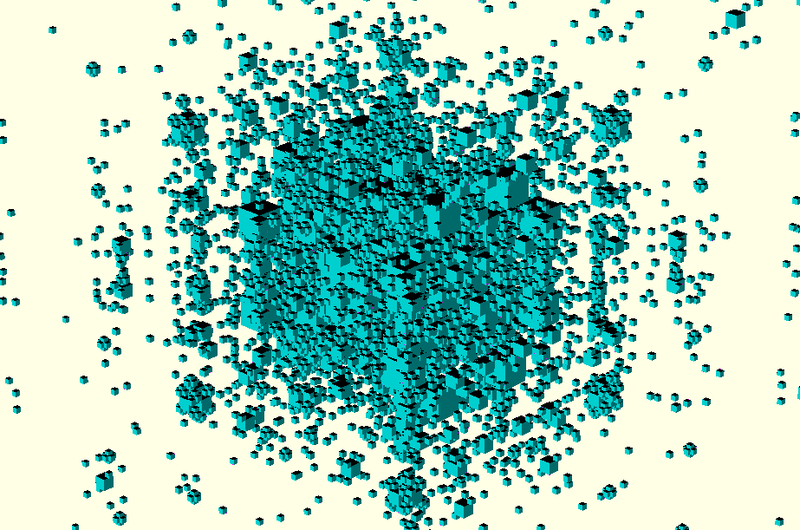 While changing the parameters in the code can give very varied and interesting results, the program still has a fair share of errors (such as scaling issues and proportions) that I would need to fix if I wanted to put it to use. 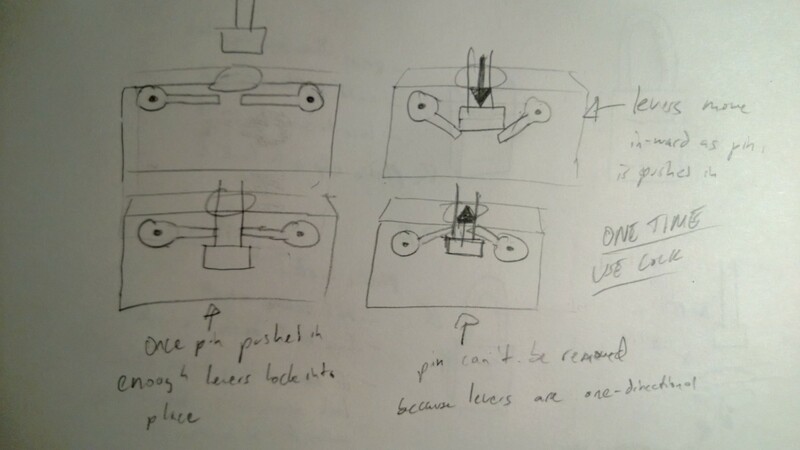 With regard to that, I would have to add details, such as leg joints, to the model if it needed to be used as reference for an actual physical object. One of the many challenges of this project was getting the lens to scale properly when the ’roundedness’ value changed. Because the square lens are constructed using a minkowski transformation, greater ’roundedness’ values mean larger cylinders are being wrapped around the quadrangle–which means the lens after the transformation will become larger than the rectangle they were formed by. Even after hours of scratching my head, I was not able to derive a mathematical relationship between the size of the lens before and after the minkowski transformation–I ended up using an arbitrary inverse-square-root equation that seemed to work well for smaller inputs. I am always fascinated by the complexity of fractals. 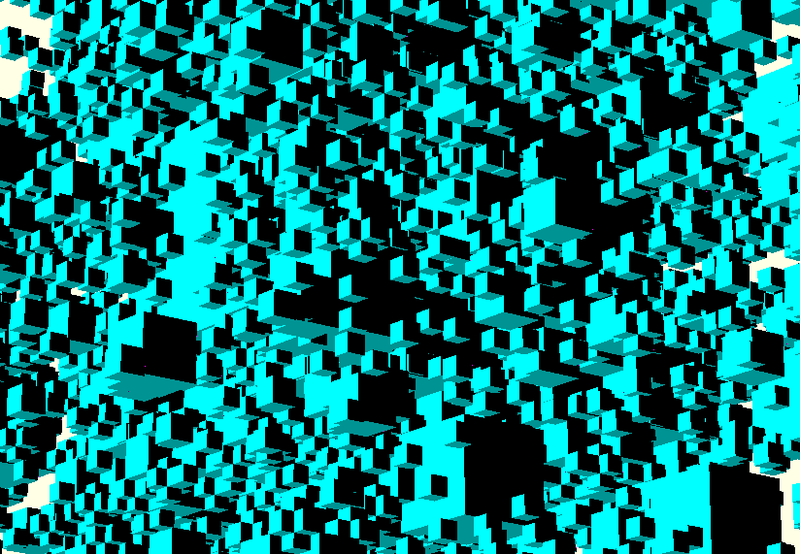 I was inspired to create a 3D fractal. 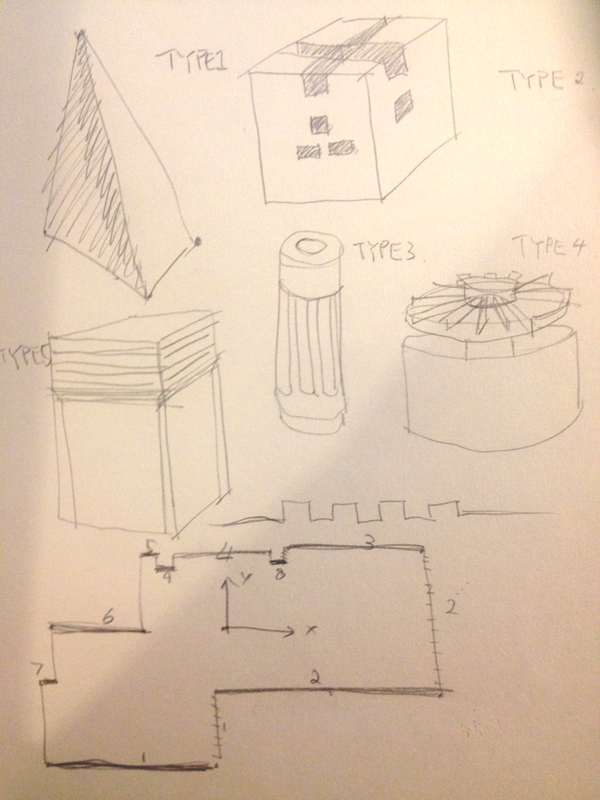 However, the design came out to be a little disappointment as I wished to have more intricate structures in the design. 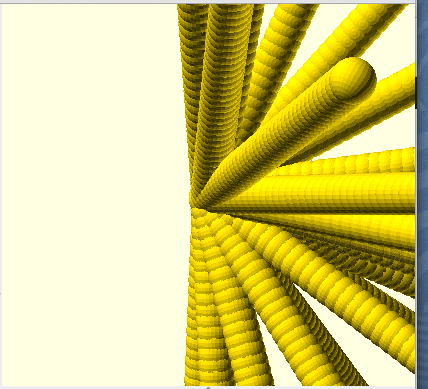 This parametric design made reference to the design by Espen Skjervold. sizeFactor=2.3;   //<-- The size factor between an object and its child objects. The smaller the factor, the larger the children will be. 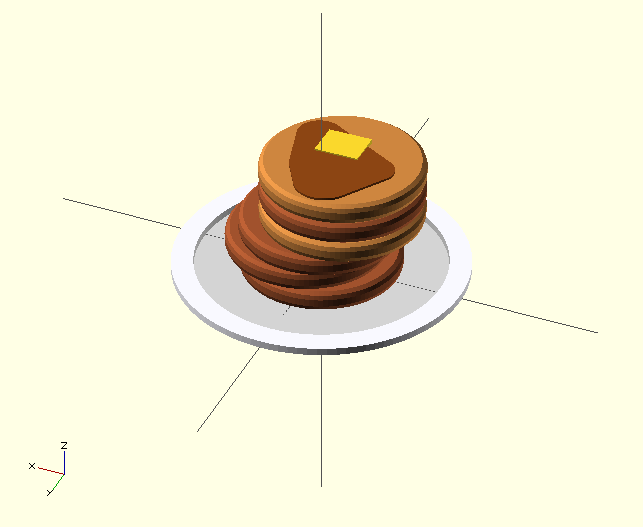 Parametric Pancakes by @kdloney is generative pancake code. 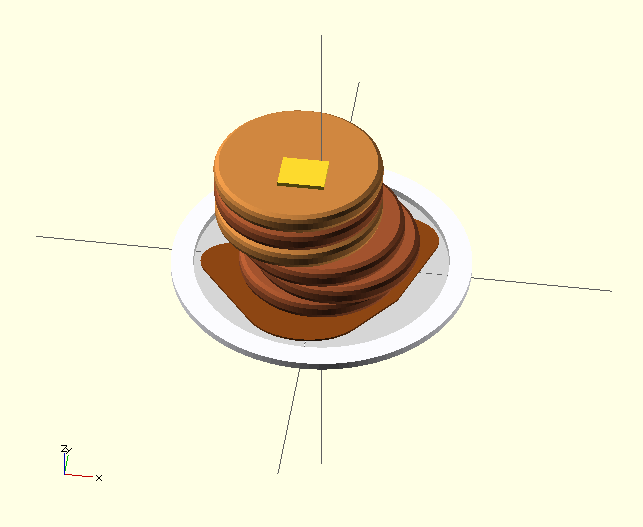 Allowing for the perfect custom pancake platter every time using #OpenSCAD. 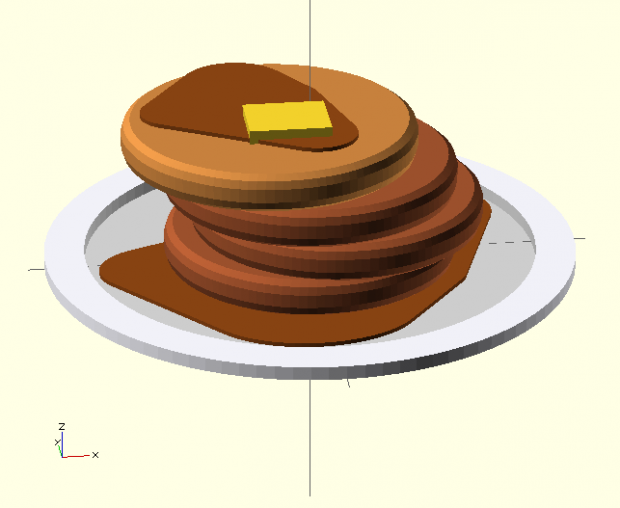 Parametric Pancakes started out as simple dream from a grad student that loves a good simple breakfast. 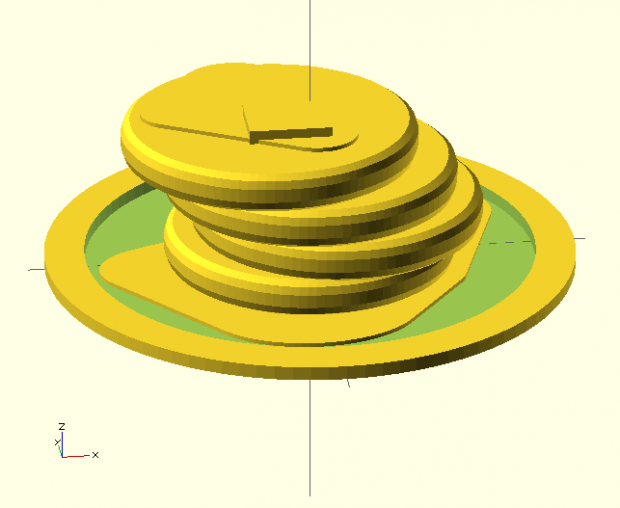 It came from the whimsical idea that one day we can live in a world that can use code to print food for us in the event that one may not have time (nor trust themselves with a stove top). This project consist of the “beauty” of fluffy pancakes, while being very “useful” to a on-the-go sleep deprived grad student. Although it may seem a bit intimidating at first glance to use code for food, once started, a whole new world can open up for the hungry tummy of every “Sussie Sue” or “John Smith” MFA candidate. Thus, this project could one day cure the epidemic that is grad student mid day or night hunger pains. 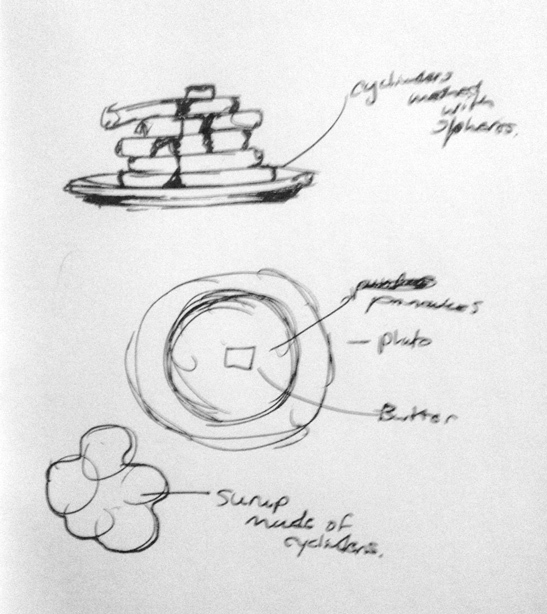 Future plans could include dynamic butter/syrup layout generators, so that you can have fun with your food’s overall attractiveness, while at the same time making other’s mouths water in complete envy. Only a tad bit of syrup on top applies to your taste? Go get ’em Grad! Take on the day! More Pancakes, no topping Syrup? No Problem! The public loves the idea of virtual butter. 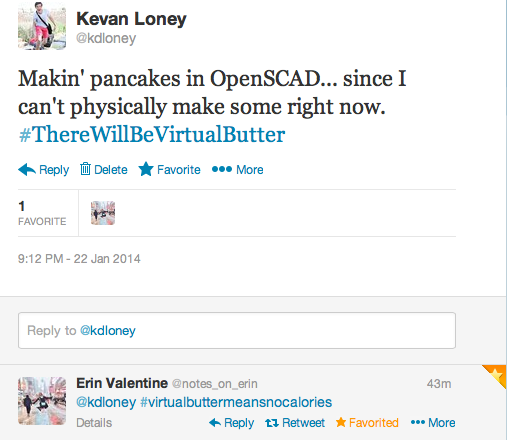 Virtual Butter = No empty calories! BuildingBuilder by @Andre_Le. An #OpenSCAD project that procedurally creates a 3D building model. 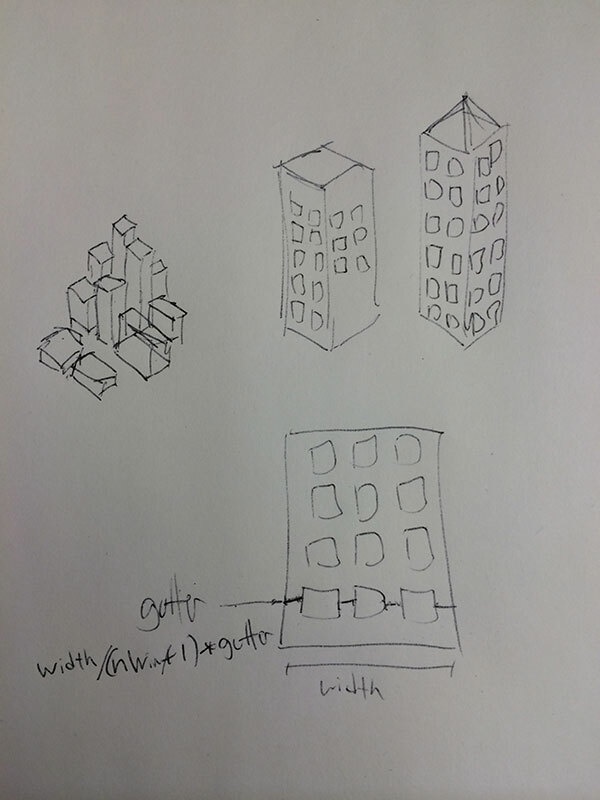 This project was built with the intention of it being a springboard for entire procedurally generated cities. 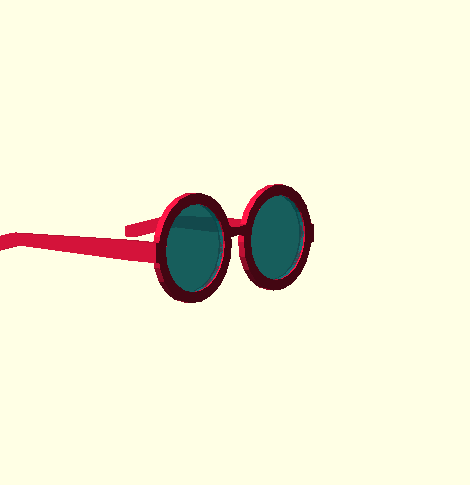 This was my first foray into anything 3D and wrapping my head around 3D coordinates and transforms using algorithms was a little tricky at first, so I opted to keep this project relatively simple. 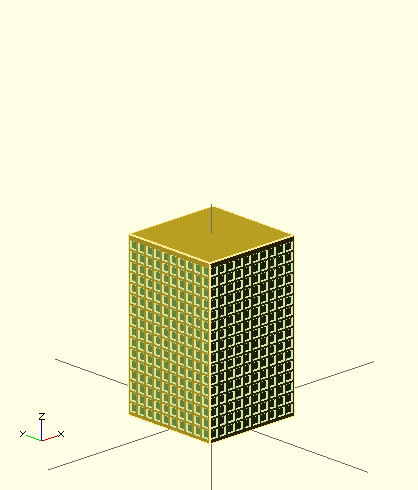 All of the properties of the building has been parameterized, so height, width, depth, number of windows in a row, and even spacing between windows can be changed.